This Washington port city sometimes gets overlooked in favor of its larger neighbor, Seattle. 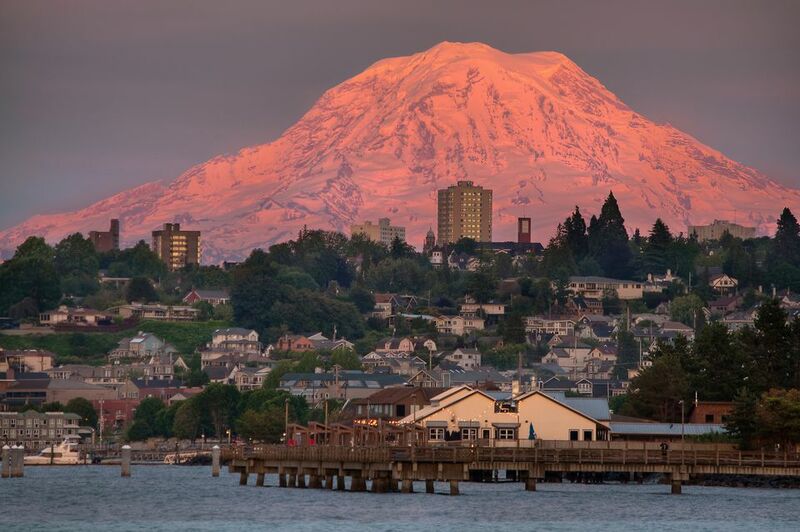 But Tacoma, the state's largest port, has plenty to offer in its own right. In the late 19th-century, the city served as the western terminus of the Northern Pacific Railroad (you can still visit the old station today), and today, it offers world-class museums, beautiful parks, and a scenic waterfront. Here are our 12 favorite Tacoma attractions. The Washington State History Museum, located on the waterfront in downtown Tacoma, displays a fascinating collection of artifacts from the state's history. You'll find exhibits that feature Native American art and people, early European settlement, state industry and labor, and geology. In addition to the permanent collection, the WSHS always offers a variety of special exhibitions on subjects ranging from Lewis and Clark in the Northwest to the photography of Edward S. Curtis. The new and improved Tacoma Art Museum almost doubles the amount of exhibition space found at the previous museum facility. As visitors meander through the galleries, they will move upward from street level to the second floor. If you are ​a fan of Chihuly glass art, the Tacoma Art Museum features a more extensive collection than you will find inside the Museum of Glass. Tacoma's Pt. Defiance Zoo & Aquarium features animals from the Pacific Northwest and around the world. Their Rocky Shores exhibit includes adorable sea otters, tufted puffins, and clever Beluga Whales. In the Asia Forest Sanctuary, you can view Sumatran tigers, white-cheeked gibbons, and Asian elephants. In other exhibits, you'll see sharks, ​seahorses, jellyfish, and octopi. The Tacoma zoo and aquarium reside within Pt. Defiance Park, where you'll find gorgeous gardens and other amusements. The Museum of Glass: International Center for Contemporary Art in Tacoma is the only American museum that features contemporary works made with glass—there are just three in the world with such a focus. You can watch glass artists at work in the hot shop amphitheater located in the metal-clad cone attached to the museum. The Chihuly Bridge of Glass links the waterfront Museum of Glass to the museums on the south side of I-705, including the Washington State History Museum and the Tacoma Art Museum. Fort Nisqually was a Hudson's Bay Company outpost built in 1833, the first European settlement on Puget Sound. Now, Fort Nisqually Living History Museum at Point Defiance Park is an incredible museum in Tacoma, with demonstrations of life in the 19th century, including sewing, farming, firearms, and more. The W.W. Seymour Botanical Conservatory is located in Tacoma's Wright Park. The historic glass conservatory, with a distinctive twelve-sided central dome, is listed on the City of Tacoma, Washington State, and National historic registers. Exotic tropical plants and floral displays can all be seen in the lovely structure, where 3,500 panes of glass make up the dome and wings of the Conservatory. This vast new museum features automobiles and the impact they have had on American culture. The museum's permanent collection shows off everything from a 1906 Cadillac to a 1963 Corvette Sting Ray to custom vehicles from movies. Special exhibitions will change throughout the year but have recently included historic BMWs and NASCAR vehicles. The LeMay Museum includes indoor and outdoor spaces for special events, car shows, and concerts. The Working Waterfront Maritime Museum offers visitors an opportunity to view heritage displays of maritime artifacts and to watch the restoration and construction of small watercraft. Children's activities and a maritime research library are also available. Located in Tacoma, the Working Waterfront Maritime Museum is building a permanent venue in a section of the historic Puget Sound Freight Warehouse. Tacoma's Wild Waves Theme & Water Park is both an amusement park and water park, with plenty of thrill rides and classic water park attractions, like a wave pool. Visitors can also enjoy a massive wooden roller coaster and a 1906 antique carousel. Food, games, and entertainment are also part of the fun. Tacoma is home to not one, but two, Emerald Queen locations: One in Fife and another off of I-5 in Tacoma. Both off Vegas-style gambling, including video slots, live-action Keno and table games including Let it Ride, Blackjack, Spanish 21, Fortune Pai Gow, Craps, Roulette and Caribbean Stud. Tacoma's historic railroad station was once the western terminus of the Northern Pacific Railroad, and it served as a train station into the 1980s. Now, the stunning example of Beaux Arts architecture serves as a lobby of a Federal Courthouse. The Tacoma building is worth a view any time and luckily, the lobby, which is filled with installations of Dale Chihuly's mesmerizing glass art, can be viewed on weekdays during business hours. Bear with us here, but where else but Tacoma can you literally have a drink inside a giant building shaped like a teapot? Bob's Java Jive is a giant teapot-shaped dive that opened in 1927 and now holds a spot on the National Register of Historic Places. It's located just off Tacoma Way.